Archaeologists have described the discovery of a "terrace" of medieval houses during excavations in Dublin as "incredibly significant." The remains of nine post-and-wattle structures from the 12th Century were found in a dig at Dean Street in the Coombe area of the capital. 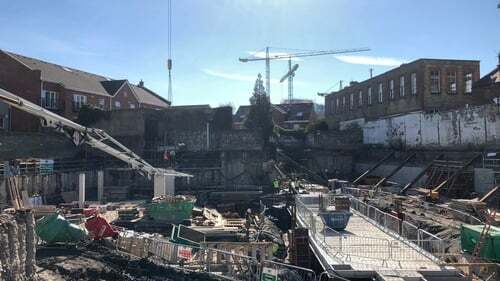 The dig has been taking place ahead of the construction of a 234-bed hotel. An array of artefacts has also been discovered, including a "beautifully preserved" drawing on slate that shows a man riding a horse. "To get a piece of artwork on slate from the 12th century that's contemporary with the post and wattle houses is a rare and fantastic find," said archaeologist Aisling Collins. "You could go your whole career and not work on a site as extraordinary as this one." The five dwellings and four outhouses would have been located outside the old city walls of Dublin. "This would have been the suburbs," said Ms Collins. The structures were preserved beneath the floors of later buildings on the site. An ornate medieval well with steps leading to it was also identified. Medieval pottery, a 13th Century silver coin and part of a bronze weighing scales were discovered nearby. A number of specialists are now involved in conserving and analysing the materials. The Hodson Bay hotel group said it would be documented "in the guest experience of the hotel." "We are partnering with an international brand on this development. Our goal will be to take this compelling story and bring it to life for visitors." Hodson Bay already operates three hotels in Ireland; Hodson Bay Hotel, Athlone, the Galway Bay Hotel and the Sheraton Athlone Hotel. The new hotel is due to open next year.